With the snow finally melting and the expectations of warm spring weather finally arriving (or nearly) here in New England; we are beginning to see more wildlife and insects moving about again. New growth. New life. While this is actually pretty exciting to see, there are certain insects, like ticks, we are less than enthused to encounter again after the spring thaw. 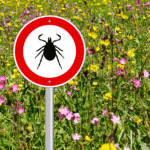 That is because recently there has been an increase both in tick populations and as a result one of the common diseases that they carry, Lyme Disease. As a result, you may be wanting to find ways to protect you and your family from getting this disease. The number one best way to prevent getting Lyme Disease is simply to avoid being bitten by ticks. Yet that is easier said than done, since the nymphs can be as tiny as the size of a pinhead (1-2 mm), making them very difficult to find. void Direct Contact with Ticks. You can do this by wearing long-sleeved shirts and pants. Secure the bottom of your pants inside socks to keep ticks from crawling up your foot and under your pants. Also, light colored clothing will make it easier to find any ticks crawling on your clothes. Wear a hat and tuck long hair under your hat. Protect pets by keeping them out of tick-infested areas, like tall grass and overgrowth. Repel Ticks with DEET or Permethrin. Tick repellents can be applied to clothing, per the product instructions. This is particularly helpful in the lower body regions and the arms. This will help prevent ticks from climbing on you in the first place. Consult your vet for tick treatment products for your pets. Carefully inspect yourself and your pets after walking in wooded areas and fields. Bathing or showering soon after may wash off or help you locate any ticks crawling on you. Wash clothing in warm water and detergent immediately. Never throw potentially infested clothing in the hamper with other clothes or on the floor. If you do find a tick that has attached themselves to you, carefully remove the tick. 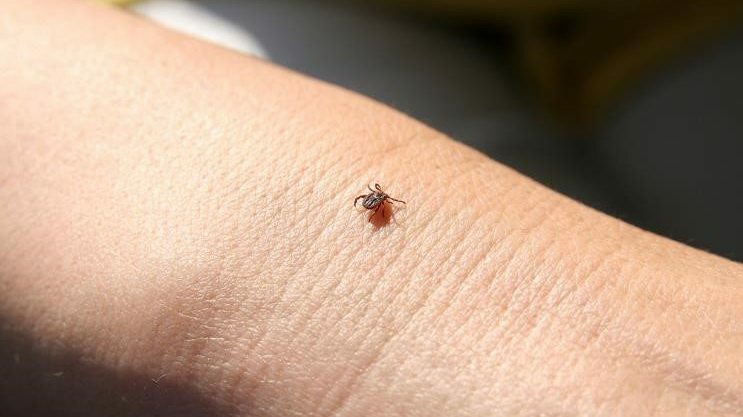 Do not squeeze or smother the tick, as it may cause the tick to release more fluid or bacteria into your skin. Instead use a tick remover, like a tick spoon, available at Modern Pest Services. Place the wide part of the notch on the skin near the tick, sliding the remover forward to detach the tick. Working slowly to withdraw the tick’s mouthparts, reducing the likelihood of the head being left in the skin. After removal wash the area with soap and water to prevent infection and put the tick in rubbing alcohol and dispose of it. Taking these actions will certainly help you avoid ticks and thus avoid Lyme Disease. However, if you want additional protection for you and your family, consider Modern’s Tick & Mosquito Control service. Our Tick and Mosquito program not only eliminates mosquito breeding sources and targets tick hot spots around your home but it also includes long-term prevention. After treatment is applied, we usually recommend an hour or two to allow for the materials to dry. This can vary depending on the weather and humidity levels. Once dry the product is non-transferable. Tick and Mosquito Control will greatly reduce the number of ticks and mosquitoes you will find around your yard. Contact Modern today for a FREE quote on Tick & Mosquito Control.